The ever colorful Colonel James “Jimmy” H. Worth left Joplin to look for a bride. His first wife, the late Gertrude Berz, had passed away in 1901. She was the widow of a wealthy German immigrant who made a small fortune before he passed away in the 1870s. After Gertrude died, Jimmy was left to a life of leisure, relying upon his late wife’s properties to provide a steady stream of income. 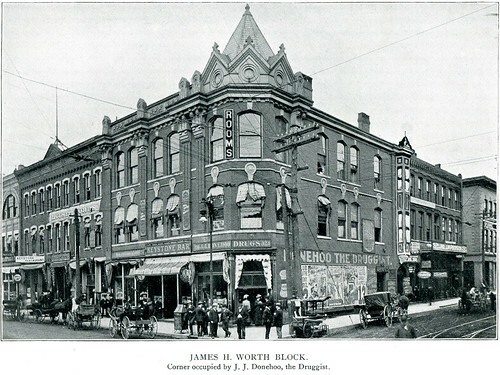 The Worth Block, inherited from his first wife, provided Jimmy a comfortable lifestyle. Although a millionaire announcing his intent to find a bride was enough to get a large amount of attention, Jimmy was ever the showman. He “disguised himself as a farmer, and as he walked about the streets of the city, he threw nickels to the large crowd of boys who followed him. He hired horses for the ladies to ride, paid for their turns at bowling, bought ice cream sodas, and took them for drives.” Sadly, Jimmy was unable to procure a bride, but had announced he had not given up hope. He declared he would return to Eldorado in a few weeks to continue his search for a new wife. Jimmy, for what it’s worth, never remarried. He was a heck of a tease and had far too much fun to allow himself to be tied down once again. In the future, we’ll try to cover more of Jimmy’s exploits, including the story of the flashing light blubs in his shoes.